Tenho estado ausente. Primeiro foi uma semana de férias e, depois, primeira semana de trabalho num sítio novo. Voltei com uma receita de manga para o pico do Verão. I have been absent. First it was a week of vacation, and then the first week of work at a new place. I came back with a mango recipe for the summer peak. Levar a polpa de fruta, o açúcar e ovos ao lume, mexendo sempre até engrossar. Retirar do lume e juntar a gelatina previamente hidratada. Envolver a manteiga partida em pedaços e emulsionar com a varinha mágica. Refrigerar. Bring the fruit pulp, sugar and eggs to heat stirring constantly until thickened. Remove from heat and add the gelatin previously hydrated. Wrap the butter in pieces and emulsify with the wand. Refrigerate. Colocar a massa num saco de pasteleiro e, sobre tabuleiro forrado a papel vegetal, tender os choux. Take milk, sugar and butter to boil. Remove from heat and add the flour. Stir well. Bring back to heat for about 2 minutes until the dough forms a ball that detaches from the pan. Place the dough in a pastry bag and in a tray lined with parchment paper, form the choux. Amassar todos os ingredientes. Estender a massa bem fina entre 2 folhas de papel vegetal. Refrigerar. Com um cortador circular, do mesmo diâmetro dos choux, cortar a massa. Colocar cada um dos círculos sobre uma bola de choux. Sugestão: Coloque metade dos choux ao contrário, cobertos com chantilly, rodelas de manga e decore com flores. Sirva um de cada por pessoa. Knead all ingredients. Roll out the dough very thin between 2 sheets of parchment paper. Refrigerate. With a circular cutter, with the same diameter of the choux, cut the dough. Place each circle over a ball of choux. 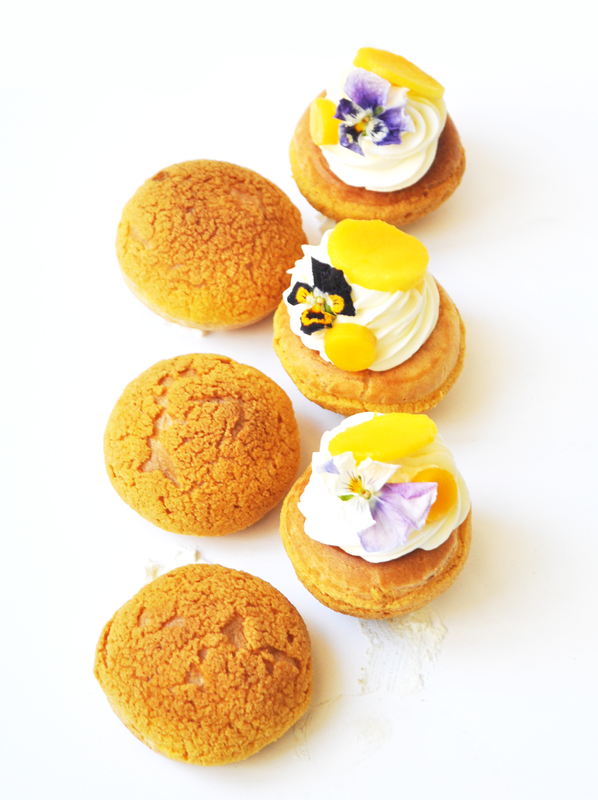 Suggestion: Place half the choux backwards and frost with chantilly, top with fresh mango and decorate with a flower. Serve one of each per person.